The Aquatec XL Bathlift is a battery powered lift will lower you to the bottom of your tub and then raise you back to the top, without having to strain knees, hips or shoulders. Reclining allows you to shampoo without getting soap in your eyes, or to lie back to enjoy the effects of the warm water. The lift lowers to 2.5" from the bottom of the tub, then the back support reclines 40 degrees. Removable covers are machine washable, with a built-in bactericide. They are made from blown PVC and there is no latex in any lift component. The lifting structure is constructed from plastic and stainless steel for ease in maintaining and cleaning the unit. The floating hand control has push button for operation of lift and a warning lamp for low battery charge. Four large suction cups secure the lift to the floor of your tub. The lift is maintenance free and rust free. 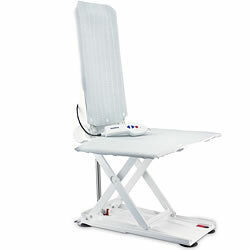 Aquatec XL Bathlift includes a 12V Lithium-ion battery with discharge protection and charger.